Point 'n click horror Stasis has a launch date and thus a launch trailer. It's gruesome. As well as dramatic shots of corpses and blood stains under flickering lights, there are voice clips from several characters that hint at a story of dark, bloody corridors and science gone wrong. I've been watching a video in which the developer—Christopher Bischoff—talks about his inspirations for Stasis. He looks at games like Halo and Mass Effect and wonders why they can't be adventure games. Stasis is designed to be an adventure game set in that kind of universe, and tell a mature story. 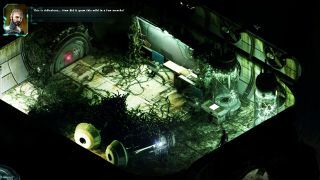 We've written a little about this game before, but in brief: it's an isometric sci-fi horror adventure in which you play a guy called John Maracheck who awakens from stasis to find himself on a seemingly abandoned spacecraft with his wife and daughter missing. Thankfully, you won't have to wait too long to find out more. Stasis will be out on Steam on August 31.